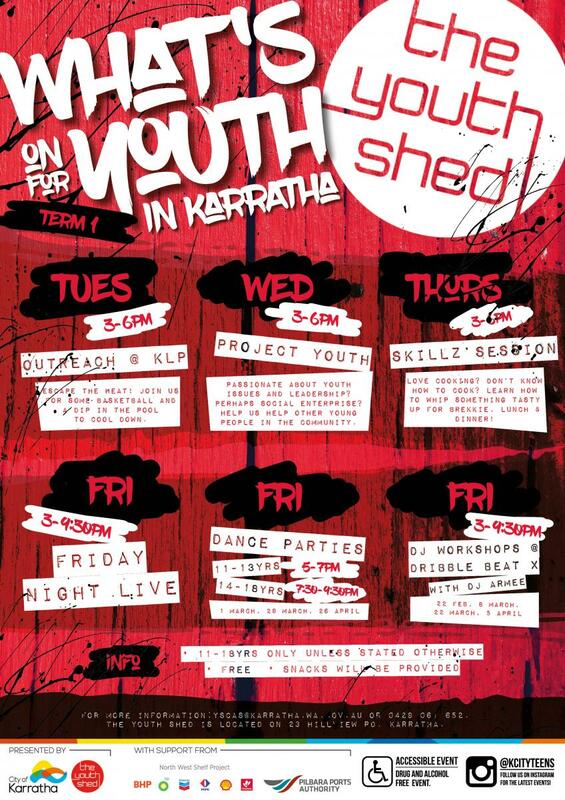 The Youth Shed is a Karratha-based dedicated youth space for 11-18 year olds. The Youth Shed offers youth free access to table tennis, computers, gaming stations and a pool table along with exciting and educational in term and school holiday programs. Visit our online events calendar for a listing of upcoming events in the City of Karratha or follow @kcityteens on Instagram for the latest events, happenings, and giveaways for young people in the City of Karratha! Remember to tag @kcityteens and #cityofkarratha #thebase #theyouthshed on your pics. A dedicated youth space for 11-18 year olds offers youth access to table tennis, computers, gaming stations and a pool table free of charge! Check out our posters to see what’s on. For more info, please call 9186 8646. The Youth Shed opening hours: Tuesday to Thursday 3pm to 6pm, Fridays 3-9pm, contact 9186 8687 for more information. The Youth Shed's youth space is fully-equipped with audio and visual equipment and is available for hire. To book the facility, please fill in the Casual Venue Hire form and email it to enquiries@karratha.wa.gov.au. Please note that the set-up and pack-down of the youth space is the hirer’s responsibility. The 2019-2023 Youth Strategy is due to be released in 2019.